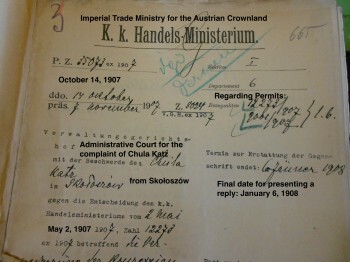 For information on ordering scans of Austrian Ministries records held at AGAD, please click here. Gesher Galicia has indexed selected files of ministry records kept by the Austrian government in the late 19th and early 20th centuries. While not specifically focused on the Jewish population, several of these files contain detailed information on people, many of whom were Jewish. This is particularly the case with records dealing with innkeepers, lawyers and certain other occupations. These Austrian Ministries files are held at AGAD in Warsaw. It is not really clear why these records ended up in Warsaw, rather than in Vienna or even Lwów (which is the source of many of the records). These “Austrian Ministries Registers” include professional registries, contracts, licenses, business issues and disputes involving Galitzianers throughout the province. There are also documents covering metrical record issues and immigration. Of special interest are a set of files involving the “legitimization” of people born “out of wedlock” – which applies to Galician Jews who were children of a couple who only were married in a religious, as opposed to a civil one. There are also files dealing with the granting of foreign passports, adoptions, annulments and divorces. 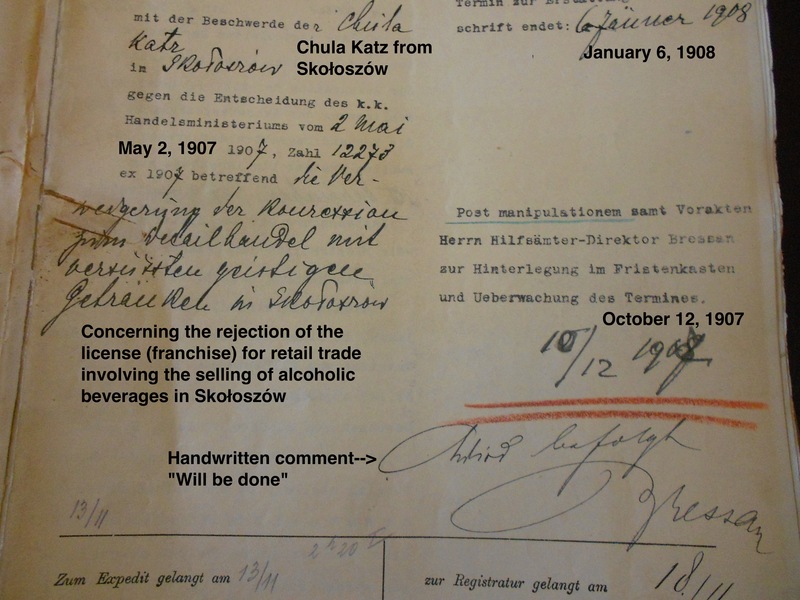 Gesher Galicia members (only) can place orders for scans of records from the Austrian Ministries files, if the records in question have already been indexed by Gesher Galicia and appear on the All Galicia Database. 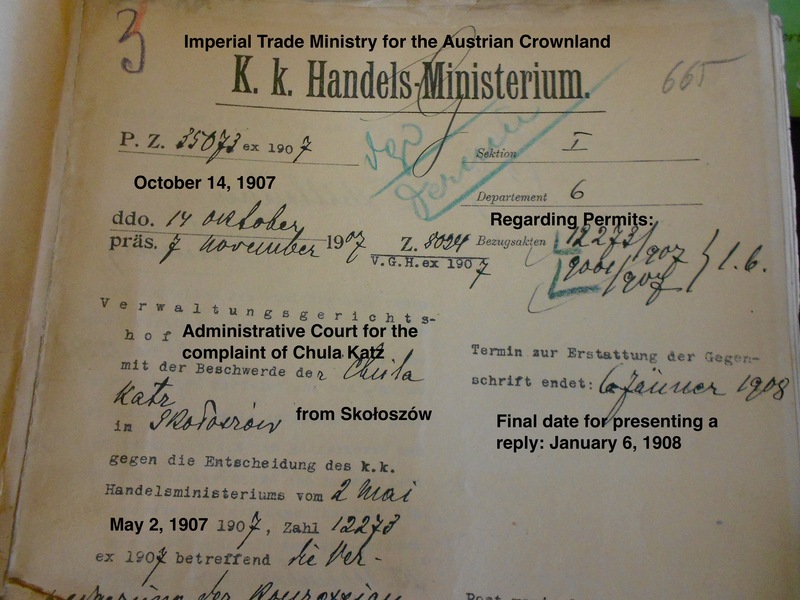 “Order of Austrian Ministries records”. – the page number or numbers (in this case 40-42). In addition, it would be helpful to mention the name of the main person in the record—in this case “Jakob Romaszkan”. After receiving your request, Gesher Galicia will place the order with AGAD. When the records are scanned, we will let you know, with the amount to be paid. Scanning records at AGAD usually takes around a month. The cost for scanning is 3 złoty per page scanned (about 0.80 USD, 0.70 EUR, or 0.60 GBP, per page). 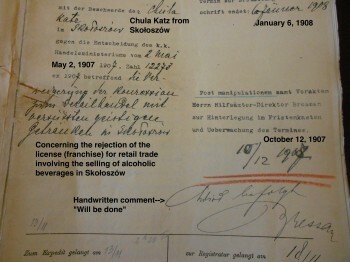 Many of the Austrian Ministries records have several pages—as in the example quoted above. Gesher Galicia also adds a charge for the service, of 8 USD for up to 10 pages, and a further 5 USD for every further set of 10 pages (or part thereof). Payment to Gesher Galicia—after you have been informed of the charge and that the scans are ready—can be made by credit card or PayPal. Gesher Galicia members in the United States can also send a check payable on a US bank. On receipt of the payment, you will be sent the digital files.